Logan Sargeant (R-ace GP) became the seventh different pole winner this season in the Formula Renault Eurocup. 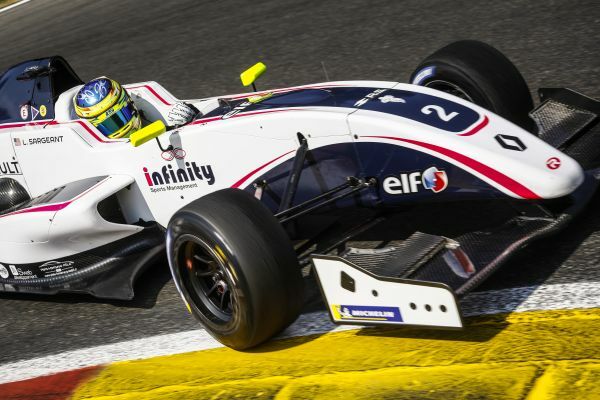 With his maiden pole in the category at Spa-Francorchamps, the American rookie will start Saturday ahead of the leader in the general classification, Yifei Ye (Josef Kaufmann Racing), and Renault Sport Academy driver Christian Lundgaard (MP Motorsport). Less than 72 hours after leaving the Red Bull Ring, the field was back on track Wednesday morning. While Clément Novalak (Josef Kaufmann Racing) and Thomas Neubauer (Tech 1 Racing) weren’t in Belgium due to medical reasons, the Formula Renault NEC regulars were out in force. During the three hours of private testing, the contenders gradually found their marks on the mighty circuit. Oscar Piastri (Arden Motorsport) set the fastest lap with a time of 2:18.9112s, whereas Victor Martins (R-ace GP) committed a day ending error. After just a one-hour break, the first collective tests got underway. Quickly at the head of the pack, Christian Lundgaard was edged in the final minutes by Yifei Ye, Jarno Opmeer (MP Motorsport) and Richard Verschoor (Josef Kaufmann Racing), but the Dane came back to post best in 2:18.683s ahead of the two Dutchmen. Thursday afternoon, the temperatures climbed to 36°. After a first exchange among Lorenzo Colombo (JD Motorsport), Max Fewtrell (R-ace GP) and Yifei Ye, Alexander Smolyar (Tech 1 Racing) went to the top of the order. Despite a few sprinkles, the times continue to improve late in the session and Victor led the way with a time of 2:19.402s. Qualifying for race 2 on Saturday, scheduled to start at 11:45, prior to the 24 Hours of Spa was the final order of business. Despite the mush fresh and more humid conditions due to storms in the Belgian Ardenne forest, the entire field headed out on Michelin slicks. In Group A, Yifei Ye ran alone in the lead of the session. The Chinese set an early best lap of 2:19.703s. Oscar Piastri then went quicker, but the Australian lost his best time for exceeding track limits and had to settle for second ahead of Max Fewtrell. The second group was the chance take in the duel between Christian Lundgaard and Victor Martins, but Logan Sargeant pulled out all the stops on his final run to take over with a time of 2:19.046s ahead of the two Renault Sport Academy drivers. Group A - Group BOn Saturday, Logan Sargeant will start ahead of Yifei Ye, Christian Lundgaard and Oscar Piastri. Victor Martins and Max Fewtrell will share row three. Thomas Maxwell (JD Motorsport), Lorenzo Colombo, Arthur Rougier (Fortec Motorsports) Richard Verschoor will round out the top ten on the grid. Victor Martins victorious at the Red Bull Ring!